As we continue to reflect on Acts, and the nature of change, another musical reflection today, courtesy of Beth Neilsen Chapman and Kieran Goss. Reflect: How does the lyric “Solid stone is just sand and water… and a million years gone by” speak to your sense of change? Monday’s post reflected on change in the Church, both in its early years and in our time. Today, we hear from David Bowie on the subject of change. Reflect: Where have you experienced significant change in your personal faith and in your institutional faith? What changes do you think are on the horizon of the Church? But We’ve Never Done it That Way! This post covers the readings from The Acts of the Apostles for the Fourth Week of Easter, Acts 10:17 through 13:12. For a list of all the readings through the Easter season, click here. This phrase, with an image of a ship slowly sinking, is one of my favorite illustrations by Jay Sidebotham, Episcopal priest and church cartoonist extraordinaire. Favorite may be a strong word. Maybe I like the cartoon because it, with great accuracy, acute precision, and flawless humor, calls out one of the great sins of humanity…being a stiff-necked people. This describes the people of God quite frequently in the words of the Bible. Acts, with its account of the first 30 years of the early Church in the immediate aftermath of Jesus’ Ascension and the coming of the Holy Spirit, even mentions that we humans are a stiff-necked people. The image resonates. If you’ve ever woken up from a night’s sleep with a stiff neck and tried to turn your head right or left, you know the feeling. When we’re stiff-necked, we can face one direction, unable to turn our gaze to see a different direction or unwilling to shift our vision to see another viewpoint. In the agricultural world (of which our ancestors of the faith were superbly familiar), a stiff-necked animal cannot be guided with bits, bridles, yokes, and the traditional aids to communicate to them the direction we’d like them to go. Being stiff-necked is an exquisite image for being stubborn, inflexible, and obstinate. And it communicates more. A stiff-necked animal cannot be guided, and because of that unwillingness to be guided, to be led in different directions, becomes quite useless to working the land or providing any benefit to the people. Oh yes, we are a stiff-necked people. If we return to the very beginning of Acts, we read about this small group of followers of Jesus listening to Jesus tell them they would receive the power of the Holy Spirit and will be Jesus’ witnesses in Jerusalem, in all Judea and Samaria, and to the ends of the earth. That may not sound very outrageous to our 21stcentury ears, but make no mistake, the idea that the Gospel of Jesus would be spread to “those people” was met with some grumbling and rumbling from the people. In fact, we read of how the people were indeed turning against the early followers of Jesus, stoning them, imprisoning them, and being otherwise unpleasant to each other. Acts recounts the steady movement and flexibility of the expansion of the early Church, into Samaria and Judea (just like Jesus said) and now, in this week’s readings, to the ends of the earth (which still didn’t include North America at this point but did include Asia Minor). 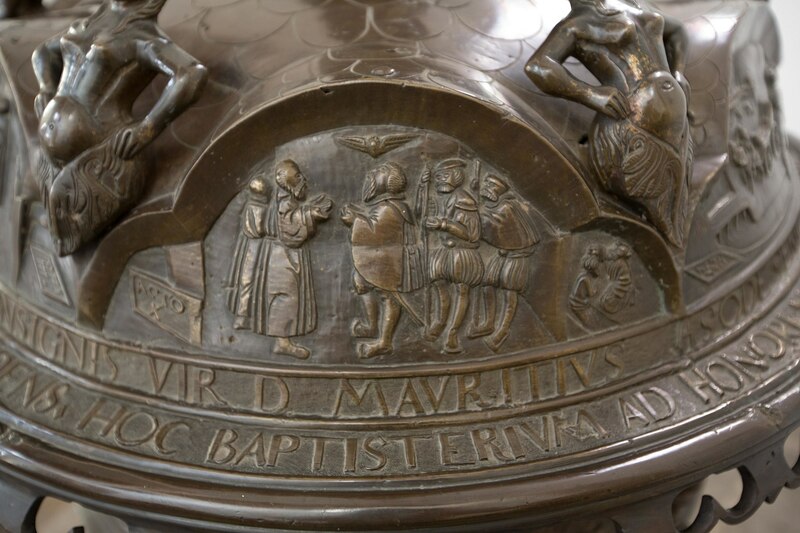 Peter baptizing Cornelius the Centurion – Detail on baptismal font in Holy Cross Church Hildesheim, Germany. Photo from Wikicommons by Hildesia. Peter encounters Cornelius, a centurion, who we read is a devout man who, with his household, feared God. Like the description of Stephen, we are to understand Cornelius is a really good guy, despite being a Roman soldier and not a Jew. But he has a vision and is compelled to find Peter. Cornelius (we can infer from the text) is among the many Gentiles who are baptized in the name of Jesus Christ. This a moment of movement, when Jesus touches the reins and the Holy Spirit guides our vision from what we have seen to a different perspective. Our necks are turned to a new vision. Or at least Peter’s is. Cornelius was a Gentile, which is a term used generally to refer to those who were not of the professing faith of the God of Israel. It could also be used to mean foreigners. In other words, Cornelius was not one of us, the majority of the early followers of Jesus would say. Make no mistake, this is a new understanding for Peter. He has had to allow God to move his head (and neck) and guide Peter in a new direction. Peter has had to change. To change, Peter cannot be stiff-necked. How has Peter had to change? For one, he recognizes an equality of nations before God. Nations are not favored because they are Israel or the United States or any governmental entity. Peopleare who God loves, and God is looking not for words in a motto or repeated ideology or a clever slogan, but instead God is interested in what we do, our acts, if you will, of faith and love. And what happens in the midst of this change, this new thing Jesus has brought into the lives of those who followed him and seemingly had the rules changed from how they initially experienced the Gospel? And the Church continues to grow in love because the faithful people had their necks turned and their vision guided into this new thing. We read Peter returned to Jerusalem and the older members of the Church grumbled about these new people, those people, who were also now part of this new thing in Jesus. Maybe not. But Jesus is about life and love, and neither one of these foundational aspects of faith is rigid and unyielding. A mystery of faith is its ability to root in the deep experiences of the past and grow to in love to the ends of the earth. God yearns for us to be part of this life-giving growth. As we continue our journey in the holy words of Acts, spend some time this week re-reading from the beginning of the book, noting what beliefs the early disciples and followers of Jesus held and how those beliefs have changed in the span of 13 chapters (and we’re not quite half-way through the book yet). Most scholars think Acts covers a time span of about 30 years. Thinking about the last 30 years or so of your life, where have you experienced significant change in your personal faith and in your institutional faith? How did you respond to that change initially? Where are you now with this change? What helped you accept and/or welcome the change and what invites you to resist change? Can you identify particular times when you and/or your congregation has been stiff-necked? What were the circumstances? How did you and/or your congregation experience the Holy Spirit in this time? Where are you now? What changes do you think are on the horizon of the Church? How have you begun to discuss these changes? What fears do you and your faith community have about change? This week, end your time engaged with Acts with this prayer. It’s from our service of Compline and reminds me God recognizes how wearying change in our life and in our church can be. Experiencing that feeling is part of being human, as is recognizing that God is with us in the midst of all the changes and chances of our lives as we grow in faith and love. Be present, O merciful God, and protect us through the hours of this night (day), so that we who are wearied by the changes and chances of this life may rest in your eternal changelessness; through Jesus Christ our Lord. Amen. Reflect: What do the lyrics of “Personal Jesus” mean to you? What’s in your spiritual autobiography—challenges included? This post covers the readings from The Acts of the Apostles for the Third Week of Easter, Acts 7:1 through 10:16. For a list of all the readings through the Easter season, click here. Horses are a big part of my life, a vital part of my life. I live with them day in and day out, and am thankful to do so. Horses are not a big part of the lives of most people. They don’t know the difference between a cutback saddle and a Western saddle or a Thoroughbred and a Saddlebred. Then the Kentucky Derby comes around…and everybody suddenly loves horses. Living in Kentucky, I can attest to the thousands of people who suddenly become very interested in all things horses. The horse farms in the area find themselves inundated with tourists groups wanting to see a champion horse. Stores are stocked with horse-related clothing, and most stores can’t sell enough. I still remember the day I stopped into a local restaurant to get dinner to go, and I was clad in muddy riding boots and jods (riding pants) from my day at the barn when a woman wanted to know where I had gotten such “authentic-looking” horse clothing. Everyone is horse-crazy for a couple of weeks, then the Derby runs, and a winner gets the roses, and life returns to its regular pace. But for those few weeks, everyone wants to be part of the story, to touch some aspect of the big event that’s happening, whether by learning about horse farms, going to the race, or simply having a Derby Party. Acts is a collection of stories, accounts, and sermons. This week’s readings contain two of the three Kentucky Derby moments of Acts, the things even those who are only casually interested in the text of the story know: Stephen’s stoning and the Conversion of Saul to Paul. The other, one account of the coming the the Holy Spirit at Pentecost, happens right at the beginning of Acts. And you know what? 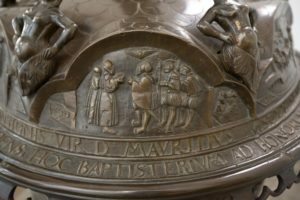 If those are the only three stories someone knows from Acts, we still touch a part of the big event that is the early days of the community of the Jesus movement. But there is so much more than just those big events, just like there is so much more to horses than the Kentucky Derby. Acts is a nuanced, complex story about humans trying very hard to become aware of how Jesus is present in their lives and how this presence calls them to change. Saul to Paul is one extreme example, but other accounts fill the text of Acts. Acts also tells us the sacrifice of following Jesus – and it’s not only a theoretical sacrifice. Following Jesus called the early Christians and calls us to give up some of the very things we are convinced we absolutely cannot live without. Following Jesus calls us to confront some true stories about ourselves we do not want to acknowledge. 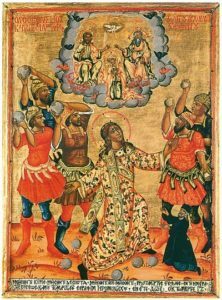 While the martyrdom of Stephen may be one of the big stories we know from Acts, many of us aren’t exactly sure why Stephen was martyred. “Well, because he was a Christian,” we might offer. 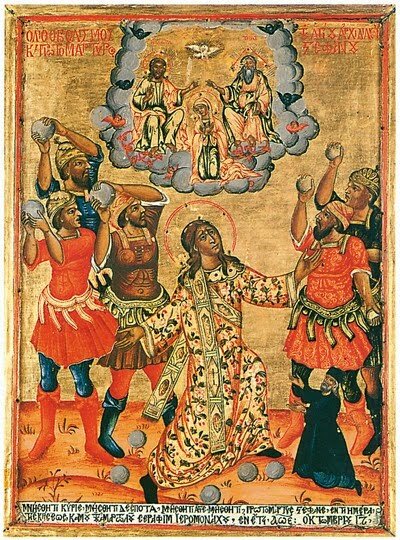 Stephen appears in Acts as one full of holiness with the face of an angel. The writer wants us to know Stephen is a good person, a really good person. However, not everyone thinks Stephen is a good person, especially the people. We aren’t given a detailed description of who, exactly, the people are. We read the elders and scribes are unhappy with Stephen, but they are named separately from the people. So perhaps we are reading an account of how quickly people can be excited by something (or someone), then turn on that same thing/person when we realize we might have to change because of this formerly-wonderful (in our minds) thing or person. Stephen is arrested, brought before the council, and questioned. In response to the accusation that Stephen is speaking against “this holy place and the law” (Acts 6:13), Stephen tells a story. He tells the story of Israel’s history. He tells of Abraham, who heard God’s call and became part of God’s covenant. He tells (albeit briefly) of Jacob and Isaac. He tells of Joseph, an unexpected player in the narrative of liberation. He tells of Moses. He, in fact, speaks longest about Moses and Moses’ wisdom and power. Stephen, however, is not finished. He keeps telling the story. He tells of how the people opposed the Holy Spirit, of how the people (and I’d hear us) persecuted the prophets. He confronts the people with our ability to love the idea of the law but to ignore completely the law itself in our daily actions. We love to hear the story and be part of the story…until we have to hear the parts that confront us, accuse us, and challenge us. Then our response is very much that of the people who heard Stephen tell his story – we become enraged. Stephen is stoned. Our modern response may not be a physical, but we still inflict the same damage when we follow Jesus in theory, but not in practice. Spiritual autobiographies have been an literary expression in the Christian tradition since Augustine, and probably much longer (and even before Christianity). At its basic level, a spiritual autobiography is a story of an individual’s relationship with God. Many who’ve been a part of Education for Ministry remember writing and sharing their spiritual autobiographies as part of the course. In the 17th century, spiritual autobiographies became a popular way for Christians in the Protestant tradition to trace their journey of faith. The ones written during this era tend to follow the pattern of recognizing the state of youthful sin into an awakening of God’s presence that then moves the person into a full state of grace. While these spiritual autobiographies always seem a bit too neatly ended with an assurance that the writer is now fully aware of God’s grace, I do appreciate their focus on the times they were confronted with God’s presence in their lives and they responded by stoning that presence of God or whatever way we try to silence the voice of love and grace that meets us where we are and calls us to be and do more in love. So what is your part of the story of the Jesus movement? But not just the good parts. What about the parts of the story we don’t want to tell? This week, spend some time reflecting on your spiritual autobiography, with a focus on the times when we were challenged by God and didn’t respond with grace and welcome. What were the major events of your life with God that unsettled you? Who were the significant people and places who disturbed you and made you aware of a limit you’d placed on love? What situations frayed the edges of forgiveness for you? When have we persecuted the prophets? When have we loved the idea of the law of love Jesus taught, but refused to embody that same law of love in our relationships with others? What parts of the story of our own lives do we not want to hear, in our person and in our church? Spend some moments each day with your story. You may want to write it out, draw pictures, or find particular songs that represent significant moments in this part of your story with God. And yes, remembering this part of our story is hard, courageous, and raw work. These words and memories are the chapters we’d rather skim over, explain away, or ignore. And they are very important parts of our story. God is with us, maybe in a particularly grace-filled way, in these parts of our story, where we, like a young man named Saul, were particularly stiff-necked, and God saw more in us. This week, engage these stories surrounded by love and the presence of Christ, and remember, like Saul, God can and will (and maybe already has) transformed these stories. Reflect: What “simple gifts” have you experienced in your life?